Maxwell is part of another preschool co-op this school year. The group consists of five children, two girls and three boys. We do a weekly number, letter, color, and theme and use the curriculum The Amazing Action Alphabet. (As of right now, I am not overly impressed with The Amazing Action Alphabet, but it is providing some structure, which is nice.) 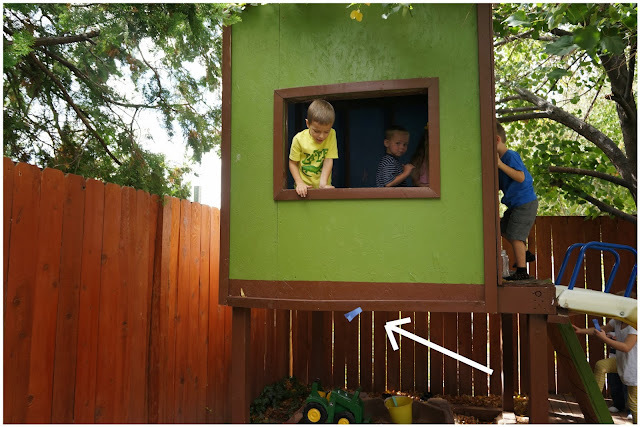 For more preschool ideas, click here. For my first week of teaching, I had the number 5, the letter S, the color blue, and "feelings and emotions" as a theme. I thought Scaredy Squirrel would be the perfect lead-in to a discussion about feelings and emotions . . . plus "scaredy" and "squirrel" both begin with the letter S. How convenient. Scaredy Squirrel is afraid of everything. He never leaves his safe nut tree, and he never varies from his very reliable schedule. But just in case disaster were ever to strike, Scaredy Squirrel is well-prepared with his emergency kit. (And if all else fails, he knows he can always play dead.) Then one day, something unexpected does happen. And Scaredy Squirrel realizes the "unknown" isn't as awful as he feared . . . even if his emergency kit falls out of his tree. 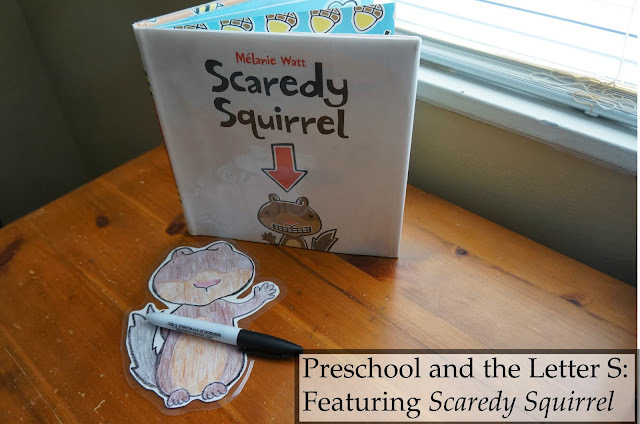 After beginning with our opening routine (welcome song, days of the week song, calendar, weather, pledge of allegiance, reading the story in the alphabet book, and doing a little worksheet), I read Scaredy Squirrel to the children. But first, we had a little discussion about things that we're scared of. Even though the kids were very influenced by what each other was saying, we still heard a variety of ideas. I only got to the first page before I had to stop. The first page reads, "WARNING! Scaredy Squirrel insists that everyone wash their hands with antibacterial soap before reading this book." So of course, we had to stop and put on some hand sanitizer. We wanted to follow Scaredy Squirrel's request. 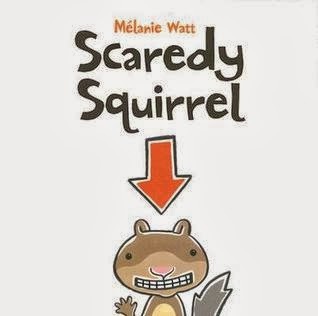 Personally, I sometimes find Scaredy Squirrel a little tedious to read aloud because it contains lots of lists and diagrams and such (which are all absolutely hilarious but make it difficult to maintain the flow), but the kids LOVED this book. Some of them are a little energetic sometimes, but all of them were motionless while we were reading. Looking back, I wish that I'd labeled all of their squares just like Scaredy Squirrel's. Some of their pictures are more difficult to interpret than others, although I know tarantulas, bees, and sharks all made an appearance straight from Scaredy Squirrel's own list. After that, we had a snack. Since Scaredy Squirrel loves nuts, we had "acorns"--really chocolate kisses, vanilla wafers, and pretzels, glued together with frosting. Super healthy, I know. In the book, Scaredy Squirrel shows several similar emotions: fear, anxiety, stress, terror, and panic. But I wanted the kids to think about more emotions than just those ones. So I decided to let them give Scaredy Squirrel whatever emotion they wanted. I drew my own picture of Scaredy Squirrel but left off his face. Then I laminated him. I made one of these for each child. I put dry eraser markers out for everyone (and lectured them about the importance of keeping them away from their clothes :-)). Then we talked about some of the other ways Scaredy Squirrel might feel. I had a white board, and as the kids thought of various feelings, I drew an example up on the board. They could then copy it on Scaredy Squirrel or come up with their own ideas. I was surprised with how imaginative the kids were with this activity. They loved it, and they were really quite good with adding little details to change Scaredy Squirrel's expressions. There is a little twist at the end of Scaredy Squirrel. As he jumps to save his emergency kit, Scaredy Squirrel discovers something amazing: he is a flying squirrel. Since he had never ventured beyond his nut tree, he never knew he had this amazing talent. Of course, Scaredy Squirrel wasn't really flying, but gliding. I thought this would be a great time to talk about how falling objects slow down based on how well they're able to catch the air. For the sake of this lesson and our obsession with the letter S, we called this soaring. 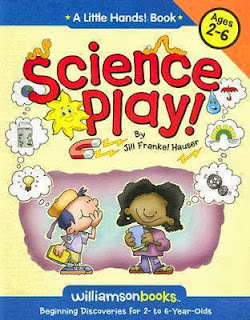 I found a great book of science projects for 2-6 year-olds called Science Play by Jill Frankel Hauser. It just happened to have a whole experiment focused around air resistance. A larger rectangle with a long slit coming in from either side, then opened up and taped to make a triangular shape. Then it was time to test the fliers. First we tried the paper strip. Then we tried the fish shape. This one was actually really cool because it spun around and around all the way down. After that, we tried the triangle shape. Now that they had three different flying examples, we went inside to work on the green piece of paper. I was amazed with their creativity. They cut and folded, and they used lots and lots and lots of tape. All of them looked so different! As a final activity, I put a basket under the club house. I told the kids they could use whichever flier they wanted. Then they had to drop them and try to get them in the basket. This was much more difficult than I was expecting. That was the end of the first day (we hold preschool two times a week). On the second day, the first thing we did (after our opening routine) was go into the kitchen and make some pretzels. I wanted them to have a more tactile experience with the letter S. I gave each of them a ball of dough and let them roll and twist and shape it into an S.
I had made the dough the night before (I used this recipe). I've never let the dough sit overnight before, but it worked out just great. While the pretzels were cooking, I had them work on a little number 5 worksheet. While they were doing that, I took the pretzels out of the oven and brushed them with butter and sprinkled them with cinnamon and sugar. We ate them while they were still warm. They were so yummy! One of the little boys is kind of a picky eater. He was in Aaron's preschool co-op last year, and I almost never could find a snack that he would eat. But he LOVED these pretzels, so I felt very gratified. 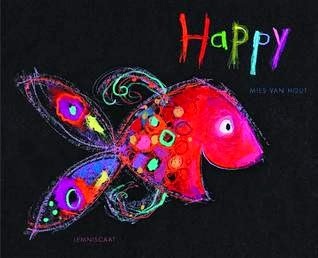 To go along with our feelings and emotions theme, we read another book: Happy by Mies Van Hout. This one is absolutely delightful. It shows one fish on each page displaying a different emotion. The emotions range from your basic "happy" and "sad" all the way to "shocked" and "jealous" and "furious." I love the variety. It's the only book I've found that covers so many feelings, and it's amazing how well the pictures express what the fish are feeling. As I read this book to the kids, we tried to copy the faces of the fish. I explained any of the feelings they weren't familiar with. Then I had all of them sit on the couch. Each one had a turn leaving the room and deciding which emotion from the book they were going to express--a simple version of charades. It was wildly entertaining to see these emotions on the children. We played several rounds of this game, and I think they would have just kept playing if I hadn't moved them on to another activity. In Scaredy Squirrel, there are a couple of pages that outline Scaredy Squirrel's schedule each day: at 7:00 a.m. he eats a nut, at 12:00 p.m. he eats another nut, etc. I thought it would be a good opportunity to have a simple lesson on telling time. But first, we had to make our own clocks. I did quite a bit of the prep work for this project ahead of time. I cut out the arrows for the clock hands. I also wrote out the numbers 6-12 on squares and glued them around half of the paper plate. I wanted the children to have both writing and cutting practice, but I knew it would be too overwhelming for them to try and write all the numbers. So far, we've learned the numbers 1-5, so I gave them a strip of paper with several squares marked on it. I had them write the numbers on the squares and then cut them apart. Then they glued them onto the paper plate to finish the clock. Then I showed them how the little hand tells us the hour, and when the big hand is right on the 12, it is exactly three o'clock (or five o'clock or whatever). 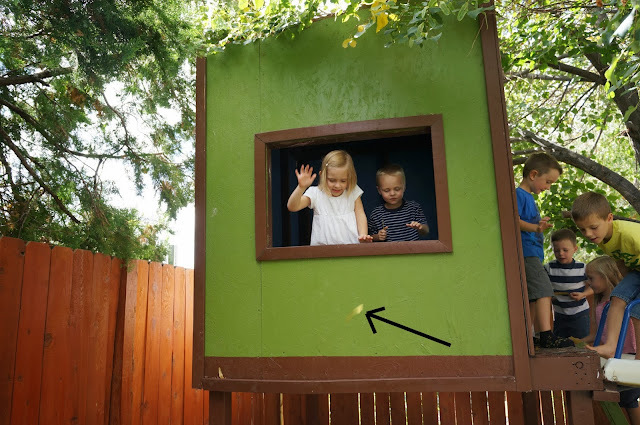 We played a little game where I told them what time it was (seven o'clock, for example), and then they scrambled as fast as they could to show that time on their clocks. Then they flipped it around for me to see. By this time, they were all getting a little restless, so it wasn't quite as fun as I was hoping for. However, when my five-year-old got home from school and saw the clocks, he had to make one, and I've since used it to help him learn to tell time, with good success. We only did one more activity after this, and it was very unstructured. Since we were learning about the number five, I told them to go on a five scavenger hunt. They could go anywhere in the house or in the backyard and round up a collection of five. It could be a collection of anything, even mismatched or random objects, but it could only have five objects in it. Here are two collections--one of animals and another of leaves. I think it's kind of funny that both last year and this year, my weeks to teach fell on the letter S. So while I don't have any lesson plans for many of the other letters, I now have two completely different lessons for the letter S.
Wow Amy! This is impressive!! Love it and those little acorns are darling. I've seen these books, but I've never read them. The activities you chose are so fun!